The second season of the Showtime series The Borgias commenced in early April 2012, picking up shortly after the events of the first series. With the forces of King Charles VIII of France occupying Naples, the time period suggested is the first half of 1495. As per season one, 3PP will be presenting reviews focusing on the art and historical elements in the show. This first episode's title itself is a clever play on words, a reference to the bull on the Borgia family crest, and also to the controversial decree issued by Alexander in 1493, the Papal Bull known as the Inter Caetera, which effectively granted the Kingdom of Spain dominion over the new world. This legislation is still a major topic of study and debate concerning land rights issues for the native populations of the Americas. A major art historical event which occured in the 1480s is alluded to in the show, though writers are careful to omit specifics of what structure was actually found. Some of the paintings depicted are lewd in nature, suggesting a pleasure palace or perhaps a large brothel. Histories of the fifteenth century recount the accidental discovery of an ancient Roman building, later identified as Nero's Domus Aurea, or Golden Palace. This discovery, apparently made by an unidentified adolescent (not the Pope) is often cited as a significant event in the artistic development of the Renaissance. Among the earliest reports of artists exploring the ruins are descriptions of the stellar team sent by Lorenzo de' Medici to decorate the walls of the Sistine Chapel - a group which included Botticelli, Perugino, Signorelli, and Pinturicchio. Later accounts describe the ruins being visited by both Michelangelo and Raphael, with the experience having a particularly profound effect on Raphael - evident in the antique style grotesques seen in the designs for the Vatican Loggia and Stufetta of Cardinal Bibbiena. In the episode, Alexander and Giulia Farnese find the ruins during a hunting expedition. Despite Alexander muttering "we must preserve these for posterity" the remainder of the episode shows artifacts that have been removed from their original location and relocated to the Vatican where the Borgia Pope hopes to use the glory of Ancient Rome to bolster his own popularity. It was not uncommon for Roman artifacts to be not only unearthed, but relocated into the great palaces of the era. Perhaps the most famous example of an unearthed treasure from antiquity being Laocoon and his sons, which some reports state was witnessed by Michelangelo. Another fun instance of anachronistic set dressing is noted in the background, where an obscured version of Canova's Three Graces (completed 1816) can be seen. 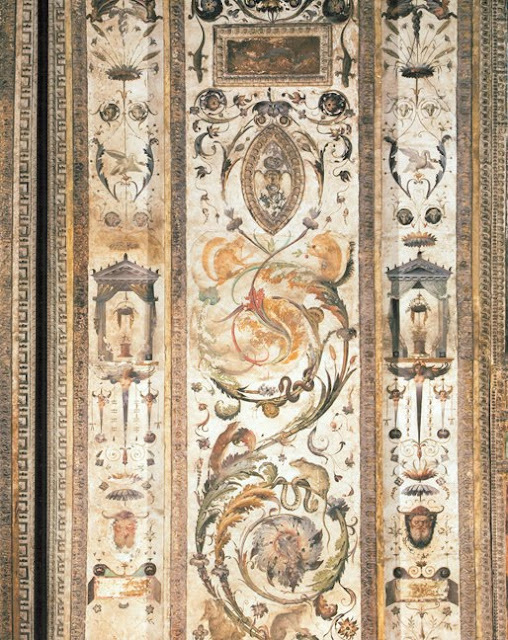 Curiously, one of the wall paintings seen in the episode is a Three Graces, noticeably similar to a famous version discovered at Pompeii (centuries later). It is important to note, although Raphael did indeed paint a version of the Three Graces that seems to be inspired by this design, Raphael's version is dated c1506 - before his documented visit to Rome. In addition, a more direct source for the pose can be traced to a Roman statue fragment in Siena, which Raphael may have seen during his time in Siena in 1501-2. The episode proceeds at a steady pace, though is devoid of any large scale battle scenes. Giuliano della Rovere, the future Pope Julius II continues his dangerous opposition of Alexander, which is emphasised by a poisoning overseen by Cesare Borgia - an event which is not corroborated by the historical record, but ties together deeds committed by Cesare to other enemies. Cesare's ambition to become head of the military is becoming an increasing preoccupation, with the rivalry against his brother coming to blows on more than one occasion. Perhaps the strongest dramatic scene in the episode shows Alexander forcing the openly brawling Cesare and Juan submit to a vow of obedience - which both make a show of, but betray clear intentions of utterly disregarding when the time is right. Meanwhile, Lucrezia and her (historically fictional for the time period in question) baby are still at the Vatican - and the writers waste no time making further allusions to her and Cesare's unnerving intimacy. One feels the baby and Lucrezia's affiliation to the Sforza won't hold until the end of the season. Lucrezia and Cesare...star and gene crossed lovers? Another curious art historical reference comes from the young artist Alexander spies making sketches from the ancient treasures - a common task for artist's apprentices. Interestingly, the artist states "he" is the apprentice of Bramante - a likely reference to Bramante of Urbino. Whilst mostly known as an architect, it is reported that his earlier career was spent as a painter. A painting of Christ at the Column (dated c.1490) is attributed to him, but still debated among specialists. Bramante was possibly a distant relation to Raphael and was instrumental in bringing him to the attention of Pope Julius II and hence Raphael being summoned to Rome. In the episode the apprentice is soon discovered to be a beautiful young woman named Vittoria, masquerading as a male. Predictably, Vittoria quickly becomes the target of Alexander's affections. Historians of the Renaissance will joke that most successful part of Charles VIII's incursion into Italy was to aid the spread of syphilis across Europe. In the episode, Charles is described as being afflicted with the "Neapolitan disease" a clear reference to syphilis. For those interested in a more detailed account of the history of the disease and its spread to and through Europe, please see references below. The first episode seemed to go little beyond setting the scene for Juan's impending demise and the eventual French withdrawal from Naples (May 20 1495). For those of us with an interest in the art and history of the period, we can only hope we may get another glimpse of Florence, increasingly falling under Savonarola's spell at this point. Glad to have you back for season 2! Cheers Anon! I'm pleased there were some decent art historical references so early in, some more in Ep 2 as well (review coming soon).